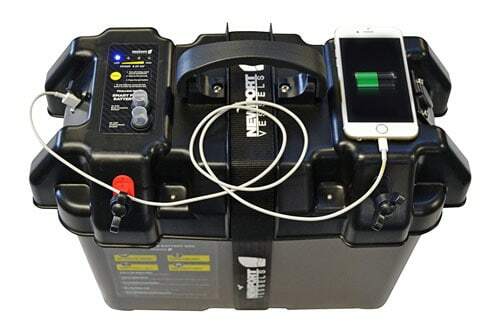 Do you need a power center (battery box) on your boat? These electric motors are plastic encased, which makes them light, thus easy to move around. Here are the specifications of each, which will be followed by a review. The Newport X-Series Saltwater Trolling Motor is a 55 lb thrust electronic engine built with 5 forward speeds and 3 reverse speeds. It’s made from stainless steel, suitable for use in both fresh and salt bodies of water. The shaft is made from fiberglass, and has a length of 36”. It also uses a transom mount constructed with strengthening nylon. The handle is designed to extend up to 6” and tilt up to 30 degrees upwards and downwards. Its propeller has 3 blades and is 10” in diameter. This trolling motor is suitable for watercrafts like fishing boats, kayaks, tenders, and SIBs with a transom. The motor works best with a 12-volt marine or deep-cycle battery, but you will have to purchase it separately. The 55 Pound NV Series Electronic Trolling Motor has an exterior of stainless steel infused with zinc properties that can make it resistant to corrosion. Despite its remarkable thrust power, the engine hums quietly while operating. The motor also features 8 speed levels – 5 selections for forward speed and 3 for backwards. Its shaft is constructed with fiberglass that sizes up to 30” in length. It also has a telescoping handle with a firm grip, and a 5 point LED battery indicator. This NV Series Electronic Trolling Motor has a powerful thrust of 62 pounds. It has a nylon mount and a 36” fiberglass composite shaft. It has a standard 8 speed controls, with 5 forward and 3 reverse speed selections. It features a firm-grip telescoping handle that can extend up to 6” in length. The motor has a 3-blade propeller. The battery requirement is a 12-volt marine or deep-cycle battery to be purchased separately. The 86 Pound NV Series Electronic Trolling Motor has a stainless steel housing, which makes it suitable to use in freshwater or saltwater bodies. The motor also features 8 speed levels – 5 selections for forward speed and 3 for backwards. Its shaft is also a composite fiberglass that sizes up to 36” in length. It also showcases a telescoping handle with a firm grip, and a 5 point LED battery indicator. The battery requirement for this trolling motor is two 12-volt or one 24-volt marine or deep-cycle batteries, but you will have to purchase it separately. The L Series Electronic Trolling Motor has an 86 thrust power than can provide enough juice to push a mid-size boat. This trolling motor is nicknamed the “big daddy” of electronic motors. Like other Newport Vessels, it also features 5 forward speed and 3 in reverse and a 3-blade propeller. It also has a stainless steel exterior. The shaft, however, has a 6” aluminum grip and is a whopping 40” in length. To power this heavy-duty engine, you will need two 12-volt or one 24-volt marine or deep-cycle batteries. Minn Kota Endura C2 is an electronic trolling motor with a maximum of 55 lb thrust power. It features a lever lock bracket that acts as a sturdy mount. It also boasts a virtually indestructible composite shaft that is 36” in length. It is resistant to flexing, warping, rusting, and UV damage. Minn Kota also has large windings that offer cooler operation and extended battery life. This trolling motor has 5 forward speeds and 3 reverse speeds. The handle has a tilt twist tiller telescopic design that provides the ultimate hands-on control for speed and steering. The motor requires a 12-volt battery. Lead Acid – Lead Acid Wet Cell batteries have lead insulated plates floating on liquid acid, which are placed in separate chambers. Nowadays, these batteries are used less and less because it can sometimes pose danger when mishandled. They are highly sensitive to cold temperature and have a tendency to release flammable gasses. When stored and used improperly, they also tend to spill acid. Not recommended. Sealed AGM – Sealed AGM batteries are more powerful than their Lead Acid counterparts. They also do not suffer from any spillage or off-gas. They do not require heavy maintenance as well. 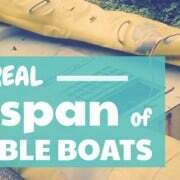 For these reasons, they are gradually becoming a favorite pick among boaters. Lithium-Ion batteries – Li-Ion batteries are the latest model of battery that has been introduced to the market. They have a high amp-hour to weight ratio compared to other types of batteries. These batteries are lightweight and fast-charging. They also have a high amp output. With these kinds of features, it’s probably the best type of battery in today’s market; unfortunately, they do cost a lot. They are twice more expensive than any AGM or Lead battery. Some motor manufacturers do not recommend using Li-Ion batteries with their motors though. Under normal use, a battery should last between 3-5 years. When it finally fails, do not throw it into the trash can, as it is toxic. Batteries need to be recycled. Before buying a battery, there are 2 things to consider. Voltage is easy enough, it’s either 12 or 24. The AH is a bit more complicated. AH stands for amp hour, which measures the amp output of a battery in a definite number of hours. This means a battery that has 200 amp hours will produce 1 amp in 200 hours. From this number, you can calculate your battery requirements. For example, a motor that needs 5 amps will last 40 hours if equipped with a battery with 200 amp hours. In simple terms, you have to consider the battery’s capacity to run your motor for a long time during its operation. This battery is a sealed deep cycle AMG battery with 55 AH. It can be mounted in any position and has 1-year warranty. It is a sealed AGM battery that has 75 amps. It provides dual use for starting applications and deep cycle operations. Unlike conventional batteries, this is slightly tolerant to cold temperature and can last up to a year even when stored or not used. This Sealed AGM battery by Interstate has 35 AH. It comes with a detachable handle that features a variety of positions that can address your need. It weighs around 23.1 lbs. It also has a battery charge indicator represented by 3 lights that glow when connected to a charger. It is best used with a trolling power center and a portable battery charger. VMAX features a sealed AGM deep cycle battery with 100 AH. It is an all-around battery that allows accessories and turns into a battery kit. It is a high-performing and trust-worthy battery. The only downside is that it’s a little expensive compared to other batteries. This is a group 27 battery, meaning it fits perfectly into the MinnKota power center. This is why they invented the battery box, also known as the power station, power center. My main battery box is this MinnKota power center. It has worked well for the last 3 years without any issues. I used to have this power station by Newport Vessels, but it just stopped working after a few months. First the battery meter, then the USB charger, then the whole thing. It’s a shame, as the MinnKota doesn’t have the USB charger. But at least it works. There are several types of chargers you can use to charge your batteries, and to keep them charged when not in use. Precision Chargers – It is a standard on-board charger that has the fastest charging time. Digital Control Chargers – This charger is similarly designed to a precision charger, but has less power than one. DC Alternator Chargers – This type of charger allows it to draw power from boat’s alternator aside from the usual AC power source. Portable Chargers – Unlike on-board chargers, this type of charger is lightweight and only requires to be attached to a battery when in need of charge. You can quickly remove it once the battery is full. Before you buy a charger, there are a few things you need to be mindful of. Bank Capacity – Bank capacity refers to the amount of batteries that the charger can power. A single bank will only have enough to power up one battery; a double bank will have enough power to charge two batteries, and so on and so forth. Amperage – This refers to the time a charger can fully charge a battery. A charger with 15 amps offers the fastest charging time, while 5 amp-chargers are the slowest. It offers 12 amperages, which is considerably fast-charging. It is a double bank that can conveniently power up 12 or 24 volt batteries. It also has a waterproof feature that comes handy when used during boat operations. It is a double bank portable charger that has 5 amps. It has a 3-stage charging process that protects batteries from overcharging. This is a double bank on-board charger that features 20 amps. It is a fast-charging and high-performing battery charger. It also has a fully sealed casing that protects the charger from water. This on-board charger is available up to 3 banks. It has an intuitive processor that allows it to adjust to the battery’s status to provide an accurate charge; preventing overcharging that can possibly damage or shorten battery’s life span. To keep your electric motor running as long as possible, you need to take good care of it. Here are a few tips on how to get the most out of your motor and battery. Rinse trolling motor with water after every use, especially saltwater trolling motors. Inspect your propeller after each use. Debris and sea weed can sometimes get stuck on it and will need to be removed. Routinely clean and lubricate the composite shaft. Consider lubricating any exposed metal parts of your motor as well. This can help prevent corrosion, especially in saltwater trolling motors. Keep your battery in full charge while in storage. Make sure your battery is not drained of power when disconnecting it from the motor. To clean corroded battery terminals, use baking soda and water. Coat battery terminals with petroleum jelly after cleaning to prevent it from corroding. Do not expose your battery to cold temperature. Store it away especially during winter season. This Outboard Motor features a 360-degree steering rotation with a lift and tilt feature for operating in shallow water. The exterior and propeller are both made from durable double cast aluminum, which is extremely rust-resistant. It also has a vertical mount engine and a standard CDI ignition system for easy starting. The F2C Outboard Motor has a superior engine cooling system that will prevent the engine from heating up while in use. It also has a lift and tilt feature for easier steering, especially in shallow water. It has a heavy-duty aluminum exterior housing and propeller. This outboard motor runs on regular unleaded gasoline. The Mercury Outboard Engine features an ultra-quiet and smoke-free operation. Unlike the first two motors listed above, Mercury Outboard Engine has an electric start-up system. It also features a multi-functioning tiller handle, auto ratchet title, and vibration absorbing wishbone mount. This outboard motor is the most popular pick for fuel-powered engines. It is powerful, reliable, durable, and portable. It is especially popular for having the ease of maneuver of 2 stroke engines in a 20 HP 4-stroke motor. Parsun Four Stroke Outboard Motor has an exterior housing constructed from high-marine aluminum alloy. It is highly-resistant to rusting and corrosion. It also has zinc coating on internal water passages to prevent them from rusting. The Parsun Motor also gives available options to fit customers’ preference: electric start or manual start and short or long shaft. 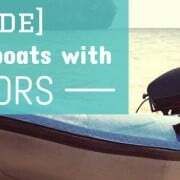 The Coleman Outboard Motor has the smallest power output in this list. There is, however, an available 5 HP for the same engine, but this is the more popular option between the two. This engine is perfect for SIBs. It has 1 cylinder OHV 4-stroke motor, and the entire equipment weighs 37 lbs. The engine operates efficiently and quietly. It also features a 360-degree steering, with adjustable steering friction and vibration reduction, perfect for maneuvering through shallow water. It has a marine alloy exterior that is durable and rust-proof. Boat HP ratings are essential in guiding you on how much power your boat will need. However, you should also take in consideration what you intend to use the boat for. This also includes who, what, and how many/much will you load into your boat during operations. Maneuvering on rough seas and carrying too many people or gears aboard may affect the performance of your motor. If you use low HP in powering your boat under the conditions stated above, there is a tendency for your motor to do heavy work during operations. Needless to say, having insufficient HP on your boat under same conditions will not even be enough to power it up in the first place; so, it really is an important factor to consider. Typically, buyers will opt to buy the least HP needed especially for boats they use for recreation. For example: If you have a boat that is rated for a motor with 50 to 90 HP, people will usually buy a 50 HP outboard motor. Ideally, it will get the job done. However, that 50 HP motor will work harder and will require more fuel; this can considerably shorten your motor’s life span and cost you a lot in refueling, so consider meeting the rating halfway by buying a 70 HP motor. Another factor to consider is your motor’s fuel efficiency. The amount of fuel that you will need will also depend on the horsepower of your motor. In general, a gasoline engine will burn 0.50 lb per HP and a Diesel engine will burn around 0.40 lb per HP. You know what this means! That’s right, the higher the HP, the higher the fuel consumption. Fortunately, as stated in the section above, there are instances wherein an engine burns fuel more than what it normally does. One of those situations is over performance of an outboard motor because of HP mismatch with usage and luggage. Another is operating your boat in full-throttle; this burns your fuel the fastest. When out in the water, do not leave your throttle wide open; operating with two-thirds to three-thirds throttle will save you lots of fuel. Note: If you’re having a hard time estimating how much HP you will need, you can use this HP calculator to determine the best motor for you. Simply, fill in the blanks and let it calculate for you. Flush out the engine, via its water pump. To flush it out, simply turn on the motor and let its water pump do the rest of the work. You may need to check on the flow of the water pump though to ensure it has no problems. Remember to let the engine burn all the remaining fuel before keeping it in storage. Regularly inspect the engine for leaks, cracks, and worn out parts. Lubricate all the moving parts of your engine such as: carburetor valves, shaft, and etc. To guide you better, watch this video about Outboard Motor Maintenance.